Think about the things you know that you consider foundational knowledge. How many of those bedrock perspectives were the result of discussion and debate (even arguments) with your peers? We often learn better when we learn with others. 1. Small groups. Relatively permanent small groups formed at the beginning of the class experience. 2. Accountability. Individuals must be accountable for both individual and group work. 3. Feedback. Students must receive frequent and timely feedback. 4. Assignment Design. Group assignments must promote both learning and team development. At EVMS, we use a modified TBL structure. Medical schools have found that strict adherence to formal TBL protocols is difficult. ‌Small Groups. Small groups are formed for Introduction to the Patient (ITP), and we use these groups throughout our program. This means that our groups theoretically work through the group dynamics and are most productive. there are 24 groups of 6-8 student each. Of course, there are usually 1 or 2 groups (of the 24) that are dysfunctional . In these cases, please contact the instructional design team for advice. TBL is not very valuable to those students who--for whatever reason--are on dysfunctional teams. We will attempt to design an intervention in those cases. The 24+/- teams are numbered and because we use TBL approaches in several classes, they know their team. We use numbered cards set throughout a classroom to identify where the team should meet. If you put the cards out prior to the students entering the classroom, they will gather as teams. Accountability. Michaelson and Sweet (2008) emphasize the importance of accountability for both individual and group work. We recommend that students come into TBL experiences with relevent preparatory assignments. In the best case, these are graded. Less accountability is required for the group work. 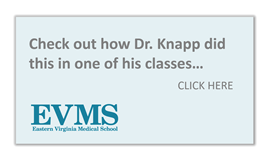 ‌Virginia, or is a top 100 medical issue nationwide. We want to present students with cases they might see. The vignette is presented either through a slide presentation, a video, or on the Google Docs site. The groups will discuss and research the solution. Ideally, they will draw on their pre-TBL assignment knowledge, as well. They will then answer the questions in a Google Doc questionnaire in class. The answers are presented and projected, and then the professor may ask a group to explain their answer, or discuss the group answers that are displayed. Feedback. Feedback is provided several ways. First, as the group spokesperson presents the group's answers, the instructor can provide feedback. Second, since all the problem solutions are projected, the instructor can address the various strengths and weaknesses of each solution approach. This type of feedback is very powerful: it is immediate and it is complete. Again, you may choose to provide individual feedback on pre-TBL assignments. BEST-APPLICATION QUESTIONS. The best questions for TBL are not factoid recital questions, rather, questions that force students to grapple with what they have been learning and then use clinician-style problem solving techniques to answer them. Click this hypertext to read Michaelson and Sweet's (2008) article regarding TBL. Michealson, L. K., & Sweet, M. (2008). The essential elements of team-based learning. New Directions for Teaching and Learning(116), 7-27.